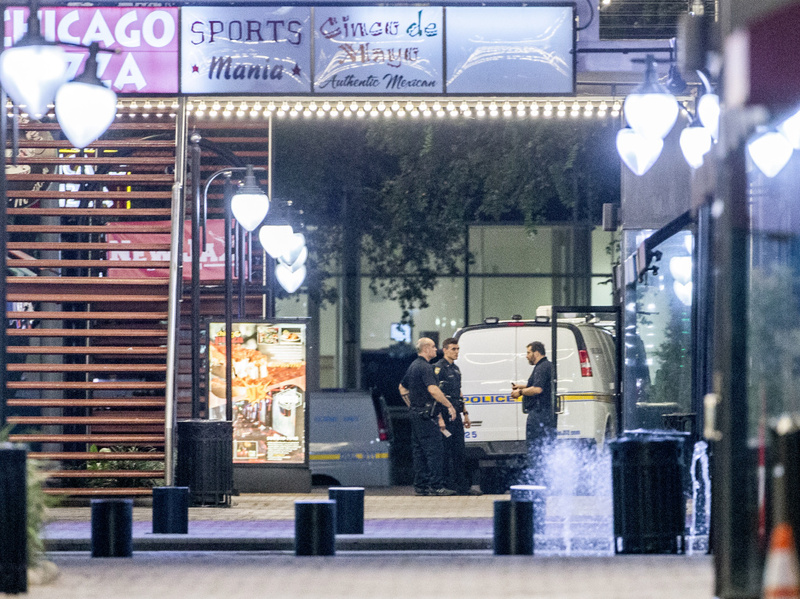 A heavy police presence remains into the night at the shooting inside Jacksonville Landing on Sunday in Jacksonville, Florida. Ryen Aleman had headphones on and a controller in his hand, playing the popular football video game Madden NFL at a tournament in Jacksonville when loud pops rang out behind him. Other competitors began bolting out of the room. Something was wrong, he thought. When he realized the jarring sound was gunfire, Aleman told his video game opponent and instructed him to follow his lead. Moving as fast as they could on their hands and knees, the two entered a stall together, closed the door behind them and both stood on the toilet, reasoning that the sight of their feet from under the stall might tip off the gunman. "I was praying. And I was saying, 'Don't worry. Stay with me,'" to his tournament competitor who now suddenly took on a far different role: survival partner. The two were caught in the melee as a gunman stalked through the venue about 1:30 in the afternoon where the gaming tournament was taking place, in the same building as a pizza shop at Jacksonville Landing in the city's downtown. David Katz, 24, of Baltimore, opened fire, killing two people and wounding or injuring 11 others before taking his own life, according to police. "I can't tell you if we're going to stay alive or not, because if he opens this stall, he's going to shoot us," Aleman told his companion. "If he does, this could be our last day." As the two men were bracing themselves, a horrific soundtrack filled the cramped bathroom stall. "You could hear people crying," he said. "You could hear people saying, 'I'm shot,' you can hear people tripping, trying to leave, scrambling everywhere, running for their lives." After some minutes passed, the gunfire seemed to stop almost as abruptly as it had started. "Let's run," Aleman advised his companion. "Let's take our chances and go," he said before rushing out. "As I was coming out, I saw three bodies on the floor, unconscious," he said. Leaving the chaos, Aleman hailed a cab and told the driver to take him to the airport, where he caught a flight back to his hometown, Corpus Christi, Texas, where he works as a roofer. "On the plane ride coming back, it just kept rewinding in my head. It was very scary," he said. At a news conference Sunday night, Jacksonville Mayor Lenny Curry told reporters that the shooting "all too common." "Tonight, we pray for the wounded and we pray for the families of those who were lost," Curry said. A video widely shared of the Madden football game that was being live-streamed on the social media network Twitch shows the game coming to a halt with the message "Controller Disconnected" appearing in a pop-up box. As viewers watched the session from around the country, the frozen screen was backed by audio of gunshots punctuated with screams and profanity. Eventually, someone can be heard saying: "Oh my god" over and over again. Authorities said Sunday that eleven people were injured. Nine of the injured sustained gunshot wounds, but officials say all are expected to survive. Police have not yet announced the identities of the two men who were fatally shot. Officials would also not say whether Katz, the gunman, knew any of the victims. In Baltimore, where Katz lived, the Bureau of Alcohol, Tobacco, Firearms and Explosives searched his house and left the premises carrying some objects in a box. Twitch, the platform that was live-streaming the tournament game during the shooting, said in a statement that, "we are shocked and saddened by the tragedy that took place in Jacksonville," adding that: "Twitch and all its staff send our deepest sympathies to the victims, their loved ones, and everyone in our community who's grieving." On the website for Electric Arts, which has sold more than 100 million copies of the Madden series, the company called the incident a "senseless act of violence that we strongly condemn." Meanwhile, Aleman, who had planned to travel to Virginia next week for another Madden competition, is now having reservations about attending. Still shaken up from Sunday, he said he needs time to heal and process the events. While dealing with "gamer rage" — a sore loser reacting with fury — is something gamers openly discuss online, it is usually brief and self-contained, Aleman said. Although authorities have yet to determine a motive for the shooting, Aleman and several other witnesses said Katz had been eliminated in a prior round at the Jacksonville tournament after winning a similar competition in February. "I get mad sometimes. I break my controllers. ... But I am not going to take it out on my opponent," Aleman said. "People get mad, but they don't go do what he did." Aleman said he knew the two victims well from playing together with them, but he was not familiar with the shooter. Speculating on a motive, he wonders why someone would want to kill over the outcome of a video game. "I don't know what was going through his head," he said. "I just don't understand."